I have some good news and some bad news. The good news is that I have finally finished Final Fantasy VIII, which I have been playing off and on since, oh, around January. This is especially good news because I was absolutely fed up with the game and wanted nothing more than to play anything else. The bad news? As soon as the sense of accomplishment began to wear off, the first thing I felt like doing was playing through the game again. It seems I have developed a dangerous dependency. 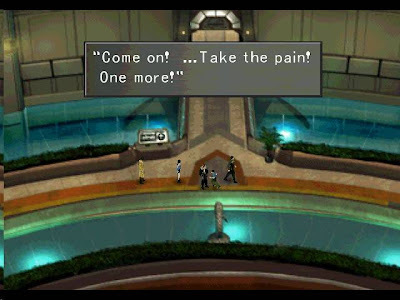 After nearly a year of playing Final Fantasy VIII, I obviously don't know how to live without it, no matter how much I wanted to be rid of it by the end. Sure, there were parts I enjoyed, but those only accounted for maybe 10-20 out of the 63+ hours I logged, and that's a pretty generous estimate; the rest of the time was characterized by indifference, frustration, or ennui. Here's the scary part: I'd say I only did about 60% of the optional material in the game. There were scavenger hunts, nonessential boss battles, secret items, and all sorts of other nonsense I either missed out on or elected not to pursue. About a third of the way through the game, when I first began to grow weary of the endless random battles and unclear objectives, I started using a walkthrough to speed me through. The walkthrough kept pointing out sidequests I should be doing, and I, foolishly, began to buy into the lie that I had to do everything. Hang out in a battle long enough to steal all the powerful magic from a certain monster? Sure. Fight the same few enemies over and over until they drop some fancy rare items? Okay. 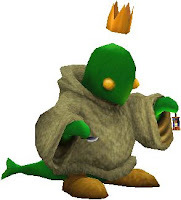 Fight one Tonberry after another in order to take on an oversized Tonberry that requires me to use more of my powerful magic and fancy rare items than I'd like to part with? I guess. After taking 15 minutes to walk halfway across a tiny room because a random battle happens with every other step, face off against a few dragons that are way too powerful for me because my character level is too high? Erm... Maybe. Win a card game against every person on the planet when the rules change whenever you play? Uh... no. Eventually, weariness won out over my completionist mentality. That's why I stopped playing Pokémon: one day it dawned on me that I didn't have to catch 'em all. 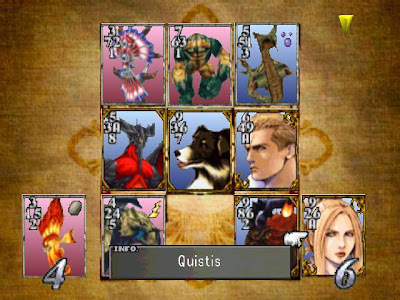 I suspect that the major reason I even considered replaying Final Fantasy VIII right away had something to do with the fact that so much was left incomplete; now that I knew what was ahead in the game and could plan and play better, surely finding all the secrets would be a cinch. Then Chuck Norris dropped through my ceiling and roundhouse-kicked me, and I began to see clearly again. I had just finished a video game I had been playing and not particularly enjoying for nearly a year. I was free! Best to capitalize on that gaming buzz and take another crack at a different game that I had been playing for too long: Star Wars: Rogue Squadron III: Rebel Strike. 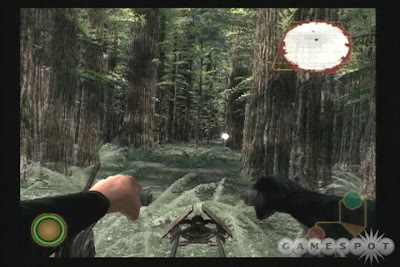 Truth be told, I barely needed two hands to count the number of times I'd played Rogue Squadron III, but I had already identified it as a game that was not nearly as fun as its predecessor, and that it would not be worth the time to find all the secrets and earn a gold (or even silver) medal on every mission. Still, I had yet to beat it, and I was originally intending to make just as much progress with the optional stuff as I had with Rogue Squadron II: Rogue Leader. With the lingering bruise of wisdom from Chuck Norris, however, it quickly became evident that I shouldn't even bother. I don't typically play flight simulators or space shooters, so Rebel Strike is a little outside my comfort zone as far as video games go. Getting through Rogue Leader required a lot more effort and retries than usual, but at least it was rewarding to try; Rebel Strike was generally more challenging (in the stupid, "WHY do I have to do this?" way) and virtually never as fun. Basically, I was putting in twice the effort and feeling half as rewarded. Not so good. After several tries, I finally figured out how to complete the speeder bike chase level that had blocked all progress for the past few weeks, and I went on to beat the game less than half an hour later. Somewhat anticlimactic, actually, but there were many more levels to unlock, and plenty of medals left to earn. I shut off the game and put it back on my shelf. At the moment, my video game backlog is fairly substantial, and there are games such as Star Trek: Armada, Castlevania III, Mega Man ZX, Final Fantasy I & II: Dawn of Souls (yes, I'm giving the series another chance), and Ghostbusters: The Video Game that I've been longing to play for months now. I can always come back to Rebel Strike once I've gone through the games that I truly want to play; no sense forcing myself through something because I liked one of its predecessors. The freedom to stop playing a video game when I no longer enjoy it? Incredible! I feel downright liberated. As a matter of fact, I'm a classic Final Fantasy fan, and VIII was the last game in the series I played. Other than the fact that I prefer the old 2D sprites to the newfangled 3D polygons, the games were just becoming too complex. But hey, the classics are good enough to play over and over again, so who needs new titles?! Configuring Guardian Forces was actually pretty enjoyable for a while, but with all the constant party shifting and the fact that I needed to revamp everything every time I got a new GF, it started to get old after a while. I rarely use magic in RPGs, so I was fine with the Draw system as well, but what bothered me was that you have a limited amount of space for magic, so I could never keep track of what I had in stock because I kept passing off maxed out magic to the people who didn't have the Draw command. I ended up wasting a lot of time drawing things I wasn't looking for anymore. The more I play the Final Fantasy games, the more I agree with you--I'll take 2D over 3D any day for RPGs, and the later titles are waaaay to complicated for my tastes, especially with the sidequests that you CANNOT figure out without a walkthrough. Who knows how they ever figured out you need X amount of Steel Pipes and Y amount of Malboro Tentacles and Z amount of impossible-to-find-naturally Remedy+'s to summon Doomtrain using the Solomon Ring that is invisibly hiding behind a rock on the overworld map? Ridiculous! So far I've played Mystic Quest, FF1, I'm playing the remake of FF1, FF4, FF5, FF6, and FF8. I like 1, 4, and MQ. I'm annoyed at 5, 6, and 8. I'll need to play 2, 7, and maybe 3 before I come to a final verdict, but I think the job system in FF5 was the breaking point where the complexity of the games became just a smidge too much for me. Though I did like the job system, the technical ramifications of being totally unprepared for battles and needing to endlessly fight random battles to max out your abilities really put a damper on how much I liked the rest of the game. Ah, well. That's material for another post, I suppose. As for the Ghostbusters game, they just released one this year that's 3D and features the voices of virtually all the original actors. I've heard good things, and I'm very excited. From the first 8, the only one I haven't played (yet) is 3. The magic in 2 is even worse than 8. In that game, the strength of your attacks depends on how much you use them (really cool idea, not so great execution). For weapons it's not so bad, but you have to cast a magic spell about a gazillion times before it's even strong enough to be worth casting in the first place. Considering that there are no characters whose magic is stronger than their physical attacks, the magic becomes pretty much completely useless. 4, 5, and 6 are my favorites, with a deserving nod to the first one that started it all. I think a little planning ahead goes a long way in 5 in terms of making sure you have the skills you need when you need them. It's a gamble, knowing when to switch jobs and which jobs to focus on, but I guess that's the price of freedom. I usually let two of my characters focus on fighting-based jobs and the other two on magic-based jobs for half of the game, and then switch them up halfway through when they start to exhaust the possibilities in their stylistic concentration. I admit that it can be frustrating, but it can be fun, too. I have to say, I was always a die-hard 8-bit Final Fantasy fan until I ran into Final Fantasy X. The graphics finally reach a point where it's worth it to have 2.5D/3D and the story is wonderfully character-centric. The gameplay isn't bad; it's interesting and relatively non-intrusive. There's plenty of extra stuff for people who like to do those things, too.